Compare Truck Bedliners & Discover Which Bedliner is the Best! You may already have an idea of which kind of bedliner you’d like to purchase for your new or used truck. Maybe you have been considering buying a DualLiner, but you were also looking at other options like spray-in bedliners or perhaps even just a cheap bed mat. Before you make a decision that you may have to live with for the life of your truck (in the case of spray-in or roll-on bedliners), look at this truck bedliner comparison and make sure you understand what you’re getting. DualLiner is the best bedliner for your truck! Our skid-free rubber bed mat prevents your cargo from shifting or sliding around. The ZeroSkid® flooring is made of thick composite rubber, which means it can control cargo, plus it can absorb shock and still provide a soft textured surface. Each DualLiner bedliner fits the contours of your truck’s bed. These thick, custom-fit UV-protected sidewalls offer maximum protection from dents and bed damage and the sidewalls are custom fit, they lock into place and cannot shift or slide around or scuff your factory paint. This is a component bedliner, meaning multiple pieces lock together to form a complete bedliner. We’ve developed a special locking “C” channel that connects our rugged, plastic sidewalls and ZeroSkid® flooring together, so your bed is completely protected without resorting to drilling or expensive coatings. Do your own research and we’re confident you’ll see DualLiner is your best choice in pickup bed protection! Offers the best protection from dents or dings. Easy installation – no OSHA regulations or training required. Long-lasting durability and resistance to fading or chalking. A true lifetime warranty even for commercial use. Easy to-your-door FREE Shipping via UPS Ground. 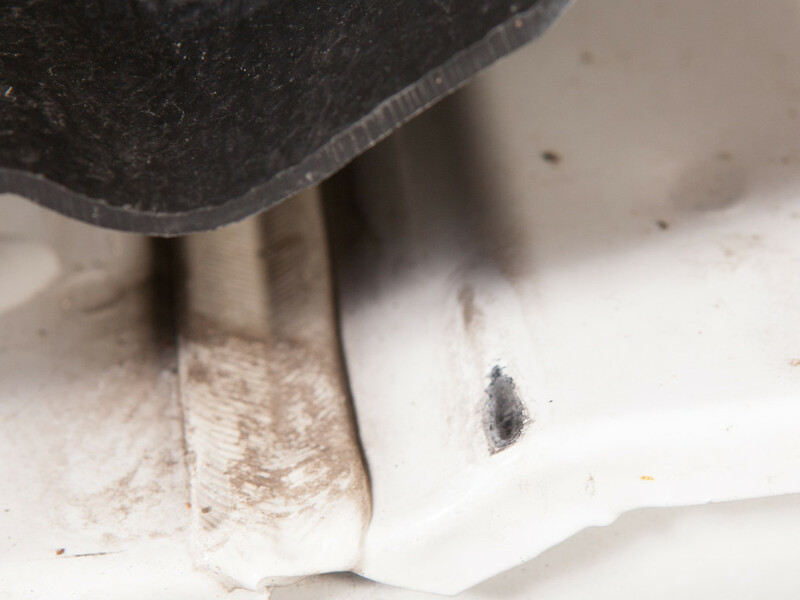 Drop-in bedliners are large pieces of hard plastic that slide into the back of your truck. On some models, the bedliner slides underneath the top of the bed rails, while other models feature an over-the-rail design. Most drop-in bedliners are not fully custom-fit to your vehicle. While they still protect your truck bed from minor dents, drop-in bedliners can rub the paint off of your truck bed and give way to rust. Also, be very cautious before choosing an over-rail drop in bed liner: the plastic can rub off the paint finish on your bed rails, leading to more rust. Other factors to consider: The hard slippery plastic makes it very easy for your cargo to slide around in the truck. The last thing you want is heavy cargo, like a toolbox or machinery, slamming into the front of your truck when you have to make an abrupt stop. Drop-in bedliners don’t always give you full access to your truck’s tie-downs. If you want to purchase a drop-in bedliner, you’re going to have to find a dealer. Unlike DualLiner bedliners, drop-in bedliners are made from one big piece of plastic, which generally must be shipped via truck freight, but DualLiner bedliners ship free to your home. 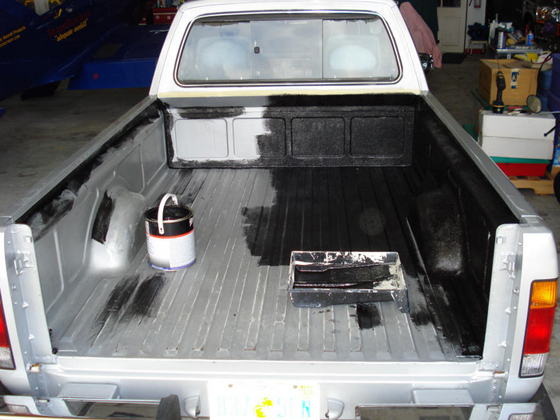 Spray-in, spray-on, paint on, or roll-on, however you refer to them, spray-in bedliners have been a popular choice among truck owners over the last decade. 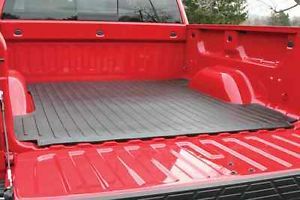 Their appeal is that the bedliner itself is mostly permanent and when they are installed correctly, they look good for the first few years on the truck. 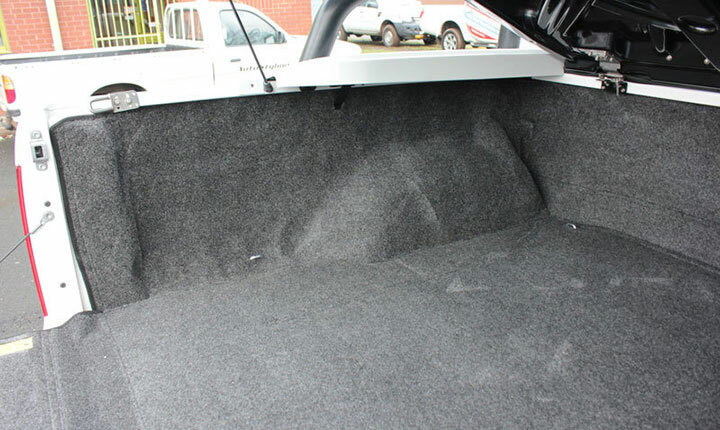 However, there are a number of things you should consider before purchasing a spray-in bedliner. First, before the bedliner can be painted on your truck, the paint must be scuffed, voiding your factory paint warranty. Once the painting, spraying or rolling begins, it’s a really messy project that is best performed by a skilled, OSHA regulated installer. Other factors to consider: The cost. The abrasive texture can damage your cargo and it doesn’t always hold your cargo in place. The paint material can chalk in the sun and tends to fade or peel over time. And since the material is directly adhered to the bed of your truck, paint-on bedliners won’t always stop dents of sidewalls or your tailgate. A carpet or bed rug liner is essentially a carpet-like material, sometimes with a foam backing. Some prefer the soft look of the material and the ease of the foam on knees. These types of bed liners can come as just a bed mat or coupled with sidewall rugs. Some users complain about stains that can occur when the bedliner comes in contact with liquids, paint, stains or petroleum products. Also, materials with frayed edges, like lumber or scrap metal, can snag the bedliner. While the major manufacturer of these types of products has a replacement guarantee, you have to foot the bill to ship the damaged bed rug back. One important thing to remember in winter, carpet can trap moisture and freeze and we’ve seen cases where the gap between the bed and tailgate were completely frozen. A truck bed mat is simply that, a plain mat, like a throw rug for your pickup bed. Unsecured, bed mats can even fly out of the truck, fold or even slide forward since it’s not locked into place. (Have you ever been behind a truck when one flies out of a bed on the highway? Scary!) It is generally a piece of rubber that lies on the floor of your truck bed. A bed mat alone does not protect the sides of your truck, the wheel wells or the inside of the tailgate. A DualLiner includes a bed mat, locked in place, so you get a safe cushion for your bed as well as side protection. Whoa! You may be considering the option of not buying a truck bed protection system, at all. That’s a mistake. 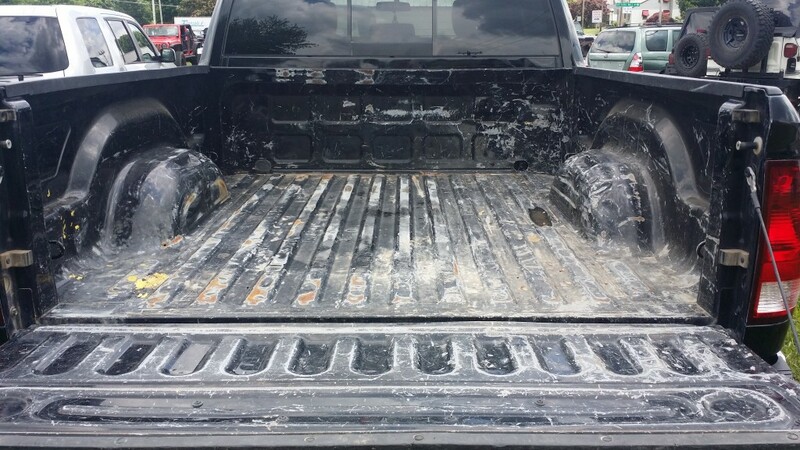 Placing just about anything in your truck bed and then driving around with it will cause scratches, dents, scuffs and rust. Make the smart choice and protect your truck bed with a DualLiner bedliner, today. DualLiner bedliners are custom-fit to your truck with hard dent protection plastic and a heavy-duty rubber floor. 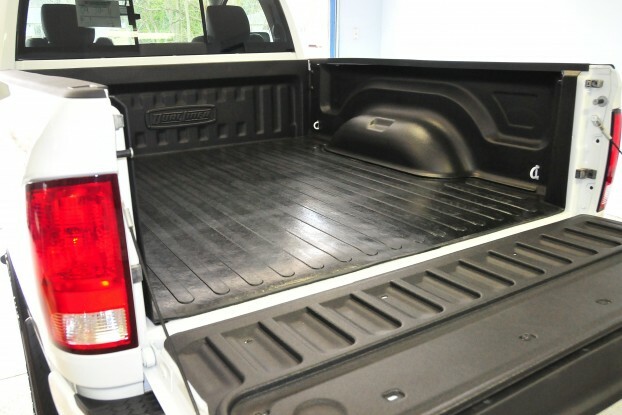 With our bedliners, you don’t have to worry about water getting trapped between the truck bed and the bedliner floor. The DualLiner ZeroSkid® rubber floor has hundreds of soft rubber cleats built into its underside, promoting air flow and allowing water to drain away through the truck bed’s factory drain holes.